The biggest externality on the planet is the failure of markets to price carbon emissions appropriately (Stern, 2007). This leads to excessive fossil fuel use which induces global warming and all the economic costs that go with it. 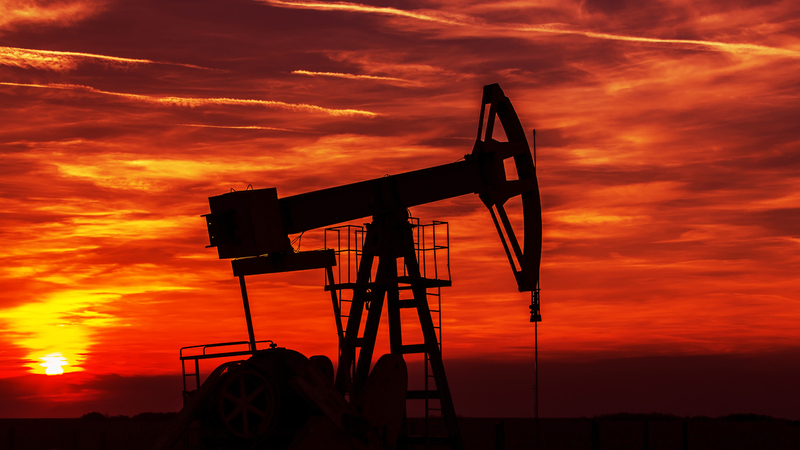 Governments should cease the moment of plummeting oil prices and set a price of carbon equal to the optimal social cost of carbon (SCC), where the SCC is the present discounted value of all future production losses from the global warming induced by emitting one extra ton of carbon (e.g., Foley et al., 2013; Nordhaus, 2014). Our calculations suggest a price of $15 per ton of emitted CO2 or 13 cents per gallon gasoline. This price can be either implemented with a global tax on carbon emissions or with competitive markets for tradable emission rights and, in the absence of second-best issues, must be the same throughout the globe. The most prominent integrated assessment model of climate and the economy is DICE (Nordhaus, 2008; 2014). Such models can be used to calculate the optimal level and time path for the price of carbon. Alas, most people including policy makers and economists view these integrated assessment models as a “black box” and consequently the resulting prescriptions for the carbon price are hard to understand and communicate to policymakers. This is why we propose a simple rule for the global carbon price, which can be calculated on the back of the envelope and approximates the correct optimal carbon price very accurately. Furthermore, this rule is robust, transparent, and easy to understand and implement. The rule depends on geophysical factors, such as dissipation rates of atmospheric carbon into oceanic sinks, and economic parameters, such as the long-run growth rate of productivity and the societal rates of time impatience and intergenerational inequality aversion. Our rule is based on the following premises. First, the carbon cycle dynamics are much more sluggish than the process of growth convergence. This allows us to base our calculations on trend growth rates. Second, a fifth of carbon emission stays permanently in the atmosphere and of the remainder 60 percent is absorbed by the oceans and the earth’s surface within a year and the rest has a half-time of three hundred years. After 3 decades half of carbon has left the atmosphere. Emitting one ton of carbon thus implies that is left in the atmosphere after t years. Fourth, the SCC is the discounted sum of all future within-period damages. The interest rate to discount these damages r follows from the Keyes-Ramsey rule as the rate of time impatience r plus the coefficient of relative intergenerational inequality aversion (IIA) times the per-capita growth rate in living standards g. Growth in living standards thus leads to wealthier future generations that require a higher interest rate, especially if IIA is large, because current generations are then less prepared to sacrifice current consumption. Fifth, it takes a long time to warm up the earth. We suppose that the average lag between global mean temperature and the stock of atmospheric carbon is 40 years. where r = ρ+ (IIA-1)x g. Here the term in the first set of round brackets is the present discounted value of all future within-period damages resulting from emitting one ton of carbon and the term in the second set of round brackets is the attenuation in the SCC due to the lag between the change in temperature and the change in the stock of atmospheric carbon. The global price of carbon is high if welfare of future generations is not discounted much. Higher growth in living standards g boosts the interest rate and thus depresses the optimal global carbon price if IIA > 1. As future generations are better off, current generations are less prepared to make sacrifices to combat global warming. However, with IIA < 1, growth in living standards boosts the price of carbon. Higher IIA implies that current generations are less prepared to temper future climate damages if there is growth in living standards and thus the optimal global price of carbon is lower. The lag between temperature and atmospheric carbon and decay of atmospheric carbon depresses the price of carbon (the term in the second pair of brackets). The optimal price of carbon rises in proportion with world GDP which in 2014 totalled 76 trillion USD. The rule is easy to extend to allow for marginal damages reacting less than proportionally to world GDP (Rezai and van der Ploeg, 2014). For example, additive instead of multiplicative damages resulting from global warming gives a lower initial price of carbon, especially if economic growth is high, and a completely flat time path for the price of carbon. In general, the lower elasticity of climate damages with respect to GDP, the flatter the time path of the carbon price. Our benchmark set of parameters for our rule is to suppose trend growth in living standards of 2 percent per annum and a degree of intergenerational aversion of 2, and to not discount the welfare of future generations at all (g = 2%, IIA = 2, r = 0). This gives an optimal price of carbon of $55 per ton of emitted carbon, $15 per ton of emitted CO2, or 13 cents per gallon gasoline, which subsequently rises in line with world GDP at a rate of 2 percent per annum. Leaving ethical issues aside, our rule shows that discounting the welfare of future generations at 2 percent per annum (keeping g = 2% and IIA = 2) implies that the optimal global carbon price falls to $20 per ton of emitted carbon, $5.5 per ton of emitted CO2, or 5 cents per gallon gasoline. 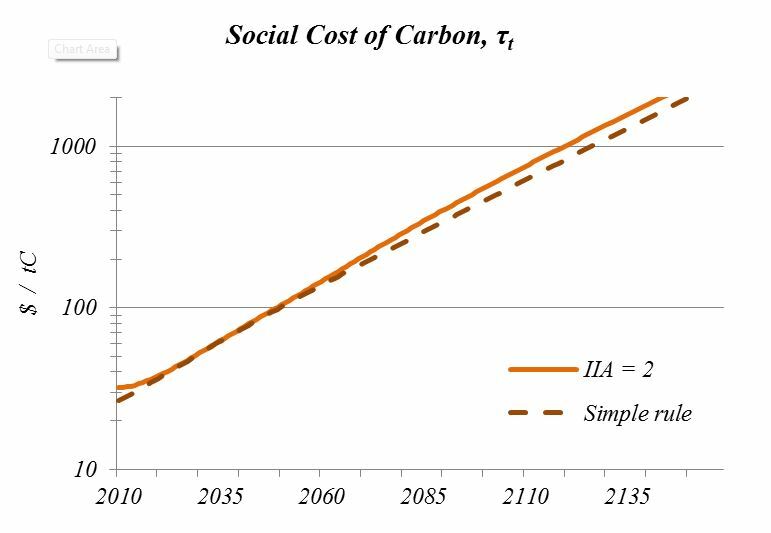 If society were to be more concerned with intergenerational inequality aversion and uses a higher IIA of 4 (keeping g = 2%, r = 0), current generations should sacrifice less current consumption to improve climate decades and centuries ahead. This is why our rule then indicates that the initial optimal carbon price falls to $10 per ton of carbon. Taking a lower IIA of one and a discount rate of 1.5% per annum as in Golosov et al. (2014) pushes up the initial price of carbon to $81 per ton emitted carbon. A more pessimistic forecast of growth in living standards of 1 instead of 2 percent per annum (keeping IIA = 2, r = 0) boosts the initial price of carbon to $132 per ton of carbon, which subsequently grows at the rate of 1 percent per annum. To illustrate how accurate our back-of-the-envelope rule is, we road-test it in a sophisticated integrated assessment model of growth, savings, investment and climate change with endogenous transitions between fossil fuel and renewable energy and forward-looking dynamics associated with scarce fossil fuel (for details see Rezai and van der Ploeg, 2014). The figure below shows that our rule approximates optimal policy very well. The table below also confirms that our rule also predicts the optimal timing of energy transitions and the optimal amount of fossil fuel to be left unexploited in the earth very accurately. Business as usual leads to unacceptable degrees of global warming (4 degrees Celsius), since much more carbon is burnt (1640 Giga tons of carbon) than in the first best (955 GtC) or under our simple rule (960 GtC). Our rule also accurately predicts by how much the transition to the carbon-free era is brought forward (by about 18 years). No wonder our rule yields almost the same welfare gain as the first best while business as usual leads to significant welfare losses (3% of world GDP). Recent findings in the IPCC’s fifth assessment report support our findings. While it is not possible to translate their estimates of the social cost of carbon into our model in a straight-forward manner, scenarios with similar levels of global warming yield similar time profiles for the price of carbon. Our rule for the global price of carbon is easy to extend for growth damages of global warming (Dell et al., 2012). This pushes up the carbon tax and brings forward the carbon-free era to 2044, curbs the total carbon budget (to 452 GtC) and the maximum temperature (to 2.3 degrees Celsius). Allowing for prudence in face of growth uncertainty also induces a marginally more ambitious climate policy, but rather less so. On the other hand, additive damages leads to a laxer climate policy with a much bigger carbon budget (1600 GtC) and abandoning fossil fuel much later (2077). In sum, our back-of-the-envelope rule for the optimal global price of carbon and gives an accurate prediction of the optimal carbon tax. It highlights the importance of economic primitives, such as the trend growth rate of GDP, for climate policy. We hope that as the rule is easy to understand and communicate, it might also be easier to implement. Dell, Melissa, Jones, B. and B. Olken (2012). Temperature shocks and economic growth: Evidence from the last half century, American Economic Journal: Macroeconomics 4, 66-95. Foley, Duncan, Rezai, A. and L. Taylor (2013). The social cost of carbon emissions. Economics Letters 121, 90-97. Golosov, M., J. Hassler, P. Krusell and (2014). Optimal taxes on fossil fuel in general equilibrium, Econometrica, 82, 1, 41-88. Nordhaus, William (2008). A Question of Balance: Economic Models of Climate Change, Yale University Press, New Haven, Connecticut. Nordhaus, William (2014). Estimates of the social cost of carbon: concepts and results from the DICE-2013R model and alternative approaches, Journal of the Association of Environmental and Resource Economists, 1, 273-312. Rezai, Armon and Frederick van der Ploeg (2014). Intergenerational Inequality Aversion, Growth and the Role of Damages: Occam’s Rule for the Global Carbon Tax, Discussion Paper 10292, CEPR, London. Stern, Nicholas (2007). The Economics of Climate Change: The Stern Review, Cambridge University Press, Cambridge.